If you’re thinking about putting up a rain barrel construction on your own, something that you can do inexpensively, then here are a some useful instructions to get you started on making rain barrels at home. 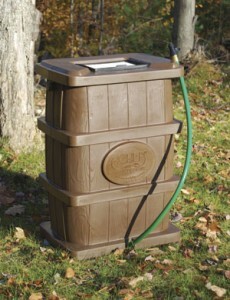 Rain barrel kits can be easily purchased from a variety of stores today. But if you want to save money, then you can always make one at home. Now, rain barrels are large containers that help contain rain water. Rain water can simply be used for watering your garden, for washing your pets, and others more. So to start-off, you’re going to have to look for a barrel that you can use. You may be able to get a hold of these big rain barrels for sale by searching online, or through phone directories for food distributors that may be near your area. Take for example a company that does the bottling for soda’s. It’s best to buy from them since you’ll be guaranteed that their barrels are free from chemicals (you’ll be happy to know that some of them even give their containers for free). Of course, you wouldn’t want to fill your contaminated barrel with water, and have this poured over your garden, or be drank by your pets. Now, if the first option isn’t doable, then you can always opt in getting yourself a large trash can (this can be in plastic or in a wooden rain barrel type). You can also find a variety of cheap ones to choose from, at local home depot stores near you. Also buy one that is clean, as you’ll be using this as your own make-shift barrel. It will be able to store for you at the most, 55 gallons of rain water. So to make your own, you’ll need to find the following things for your make-shift barrel: an electric drill, a 6-inch hole saw, a 29/32-inch Drill bit, a ¾-inch Pipe Tap, a Louvered-type screen, a ¾-inch faucet (brass preferably), a Teflon tape, and a ¾-inch hose adapter. With these tools and materials on hand, you may now proceed with building your rain barrel. The first thing that you’re going to have to do is to drill a 6-inch hole on the barrel top using your hole saw. Also drill holes on the top (to make way for the overflow) and bottom (for the spigot) of the barrel using your 29/32-inch drill bit. The next thing you should do is to insert and twist-in the ¾-inch Pipe Tap into the holes that you’ve previously made (the hole made on the top and bottom, by means of your 29/32-inch drill bit). Clean the barrel afterwards but do not use chemical products to wash it. The next step for your diy rain barrel is to wind-in the thread part of the hose adapter; and then insert this into the barrel’s top portion. You’re going to have to set this up by covering it with Teflon tape (5 rounds of it), and then sealing it with some sealant. As soon as this is done, you may now insert the end-part of the faucet into the hole. To finish the project, you’re going to have to cover the barrel’s top by putting on the louvered screen (the screen part should be facing down, and the louvered facing up). Also, insert a hose inside the hose adapter, to help with the water overflow. You can also do a make-shift rain barrel downspout by attaching this on the barrel top, and on your roof downspout (so that the rain water can go directly into your barrel). And after this, you’re done! This is as as easy and as cheap to making rain barrels at the comforts of your own home. So, try your hand at it right now! There are a variety of Rain Barrel options to choose from, here at Gardenworms! Use our secure and quality-made barrels for your home use. With its nice design, you may simply place one at your backyard discreetly. Conserve water by simply getting your own Rain Barrel today! To know more about the product, check the Rain Barrel here. What is water to your garden and Red Wiggler worms? Water is a very important component for your Red Wiggler worms. Red Wigglers are most comfortable and healthy when they are moist and wet. That is why they want their beddings slightly moist and wet when you prepare it for them in their snug compost bins. You red worms want their compost bins to be watered and made wet on a regular basis to maintain that healthy and satisfyingly moist environment that they like so much. Water is also a very important component of organic gardening. Plants cannot survive without water. No matter how much sunlight and rich fertilizer you give to your plants, if they are not supplied amply with the right amount of water, they will not survive. This applies even to humans. If we do not consume ample amount of water, we will not survive. Man can live for weeks without eating but on the average, we can last no longer than two days without drinking water. That symbolizes the importance of having a constantly ready supply of water to your worms and your home garden. 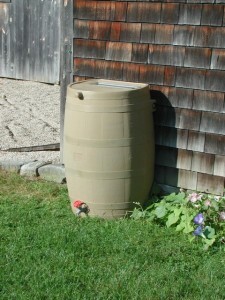 One surefire way to always have water for your red worms and your worm composting bins is to have rain barrels at home! Having a rain barrel need not be expensive! You can build one at home! Building rain barrels to supply your compost bin of Red Wiggler worms and home garden is very inexpensive! All you need is a food-grade quality barrel, a simple garden hose washer, some standard garden hose parts, a special adapter, a pair of heavy duty scissors, a keyhole saw and a 1” drill bit and you are ready to take off! First of all you have to make sure that the barrel you are using did not hold anything toxic previously. In this case, a bigger barrel is always better. It is also preferable that you find a plastic barrel, but if you do not have one then be comforted in the fact that using metal barrels is still effective. The first thing that you have to do is saw an opening on the top of the barrel. It is advisable that you saw an opening on the middle of the rain barrel. But if you find it more effective to saw an opening off of the center of the barrel you may also do so. Then you have to drill a 1” hole near the bottom of the barrel. After drilling, you attach the adapter and the washer on the inside of the barrel. Then, you have to attach the valve on the outside of the barrel. After doing all these, you then have to work on the downspout of your gutter. Modify the downspout in such a way that it would spew its contents onto your rain barrel. This is so the rain water that falls on your roof and your gutter can be directed onto your rain barrel. You can also add another rain barrel by using a garden hose Y-adapter to connect your first barrel to another barrel! After doing all these things, you are now set to capture all that fresh rain water! Through this system, a 55 gallon barrel could easily be filled within a matter of minutes! All this rain water is great for your garden plants and Red worms! You now have an enormous water supply for your garden and red worms and best of all, it is free! Now, you do not need to open your hose to water your garden or moisten the compost bin of your Red worms. Now, showering your home garden and your worms need not cost you anything and it is all because of a simple rain barrel. The rain barrel is truly one of the most effective organic gardening tools for your home garden and your Red Wiggler worms. The RainSaver Rain Barrel is perfect for catching fresh supply of water everytime it rains. This hi-quality rain barrel has an overflow located at the back to keep you relax and away from worries about overflows. The excess water or rain will be diverted to your garden. Also, safety is incorporated in its design so it’s child proof and keeps pests from getting inside. 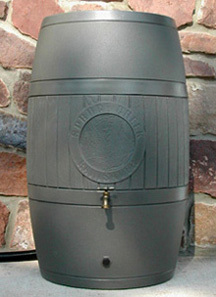 Order the RainSaver Rain Barrel here.